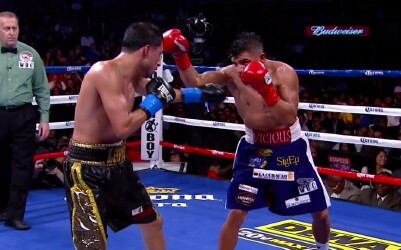 By Allan Fox: Former WBC welterweight champion Victor Ortiz (29-4-2, 22 KO’s) will make his ring return in two months in September, according to his promoter Richard Schaefer of Golden Boy Promotions. Schaefer says he’ll be announcing the 26-year-old Ortiz’s comeback within a week. Ortiz hasn’t been able to fight ever since suffering a broken jaw in his fight against Josesito Lopez last year in June. It was an especially bad breakage, as Ortiz had his jaw broken in two places. Schaefer needs to take it easy on Ortiz and match him softly for a while because he’s lost his last two fights to Lopez and Floyd Mayweather Jr. Ortiz needs to remember what it’s like to win, because the worst thing Golden Boy can do is to put him in with a good fighter and watch Ortiz get beaten again. Ortiz quit on his stool after the 9th round against Lopez, and Ortiz quit in the 6th round against Marcos Maidana in June 2009, and some boxing fans feel that Ortiz quit in his 4th round TKO loss to Floyd Mayweather Jr. by dropping his hands in the 4th round in September 2011. Ortiz has got good hand speed and power. When he’s fighting well he’s hard to beat, but he seems to have problems when he’s dealing with adversity. It’s almost as if Ortiz doesn’t expect his opponents to attack him with their shots, and when they sometimes do, he crumbles mentally. Ortiz was dominating Lamont Peterson in the early rounds in his fight with him in October 2010, but when Peterson started taking the fight to him, Ortiz backed off and ran despite having a significant power and weight advantage over him.